It was early on Friday afternoon. 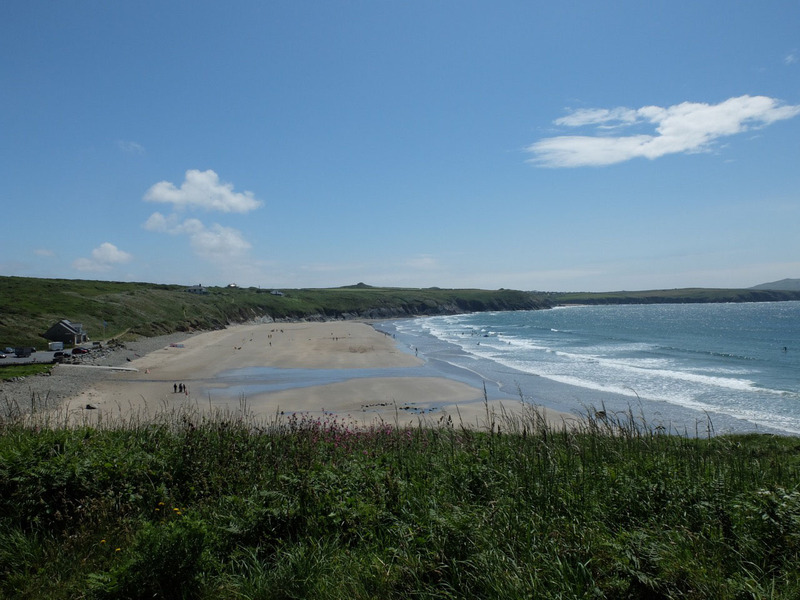 Lizzy, one of our Companions in the Silent Eye, had assembled us for the start of three days of delightful discovery on the western fringes of Pembrokeshire, centred on the lovely town of St David’s, home of one of the most remote cathedrals in Britain. 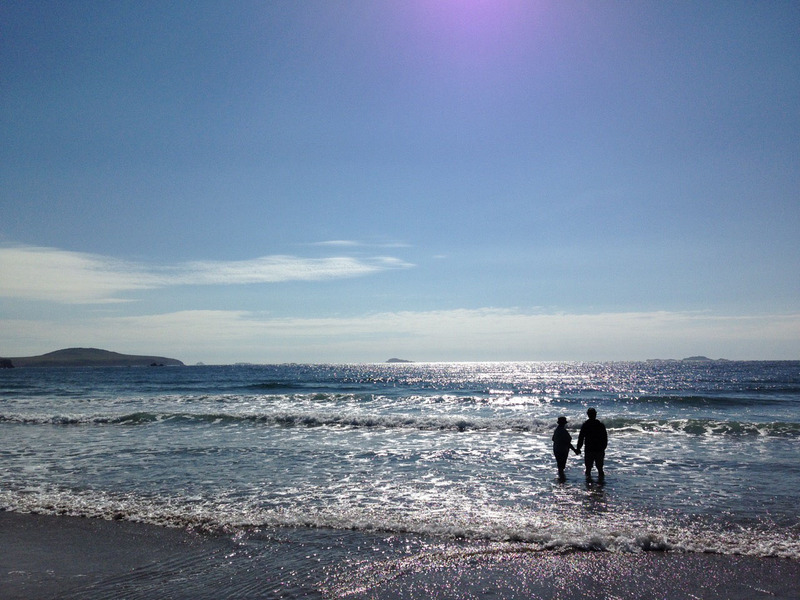 As promised, we met, on the car park above Whitesands Beach, for coffee and…ice cream. The weather was hot, the air clear and the sky blue – perfect conditions for the opening walk on what was to prove an adventurous and wonderful weekend. The ice-cream reluctantly finished, we resisted the quite reasonable demands for another and set off along the cliff path that leads to the distant vista of St David’s Head. The town of St David’s gets its name from the patron saint of Wales, who was a Welsh bishop of Myryw (now renamed St David’s) during the 6th century. 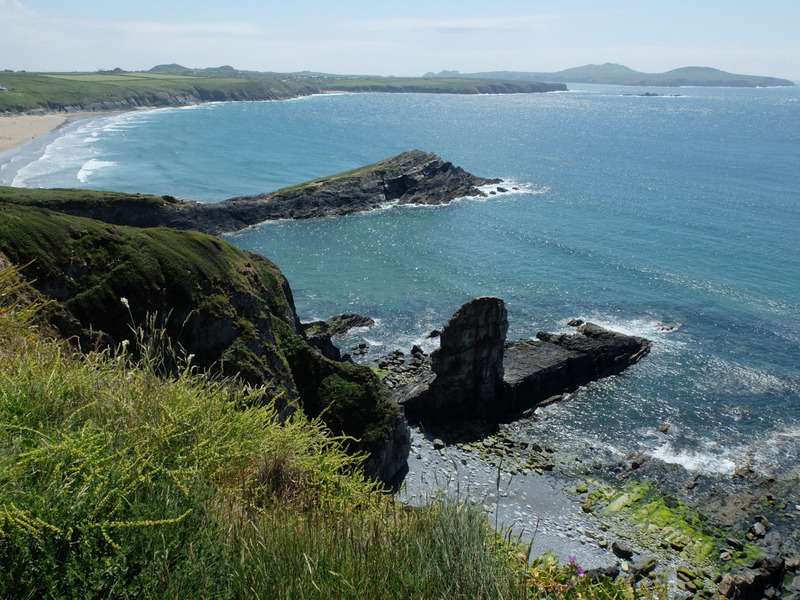 He is believed to have been the son of a high-born nun–Saint Non, and the grandson of Ceredig ap Cunneda, King of the ancient land of Ceridigion – now part of Pembrokeshire. Other, more dramatic tales say that the lady who became St Non was raped by a local prince and bore the resulting child as her own, bringing him up to take his place in history, despite the trauma of his conception. We will return, in the final post, to the Chapel of St Non, in its idyllic setting close to the ocean beyond the present town of St David’s; and to the magnificent Cathedral of St David’s. This part of the Welsh coast is one the the most beautiful places in Wales, and has that ‘other worldly’ feel about it which marks out secret gems of landscape that stay in the heart, forever. It is also the home of some of the most ancient stone structures in Europe. We reached St David’s head after about an hour of walking. 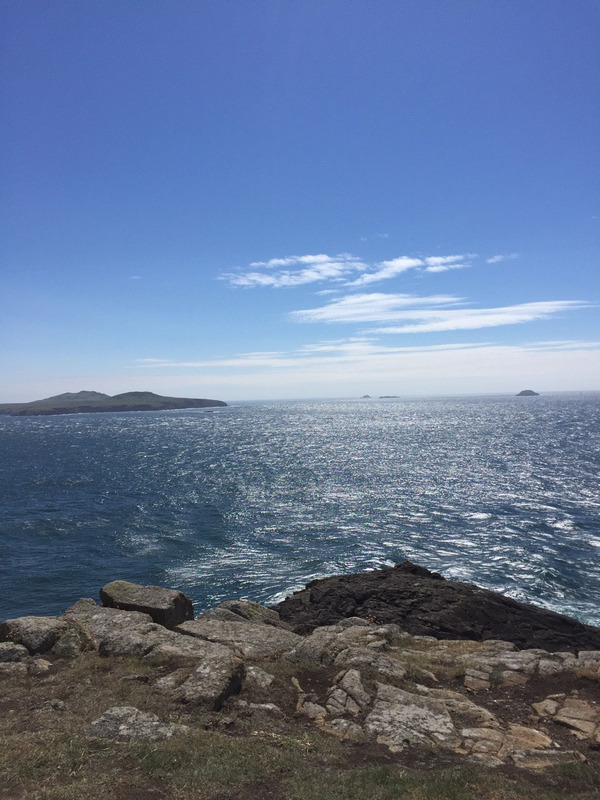 The cliffs are very steep and we were advised to ‘look the other way’ as we rounded curve after curve on the high path – with the dark blue of the ocean a long way below. Arriving at the headland, we did what a group of Silent Eye folk often do – go very quiet… in the face of the beauty of what lay below, and its ancientness. Much of the rock in this part of Wales is volcanic in origin, and is over 500 million years old. 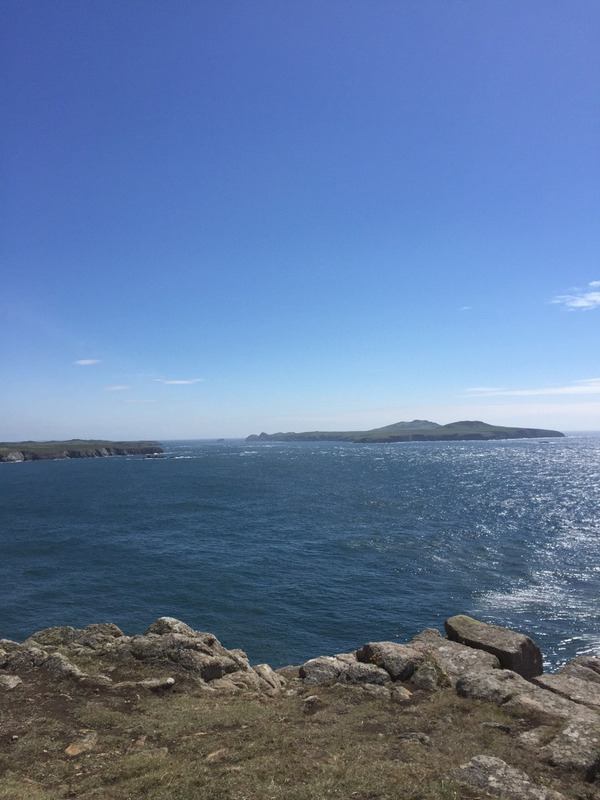 In the distance, off to the south-west, can be seen the rocky islands of Ramsey, Bishops and Clerks several miles out to sea. On the section before the headland we had passed the remains of a stone-age settlement. 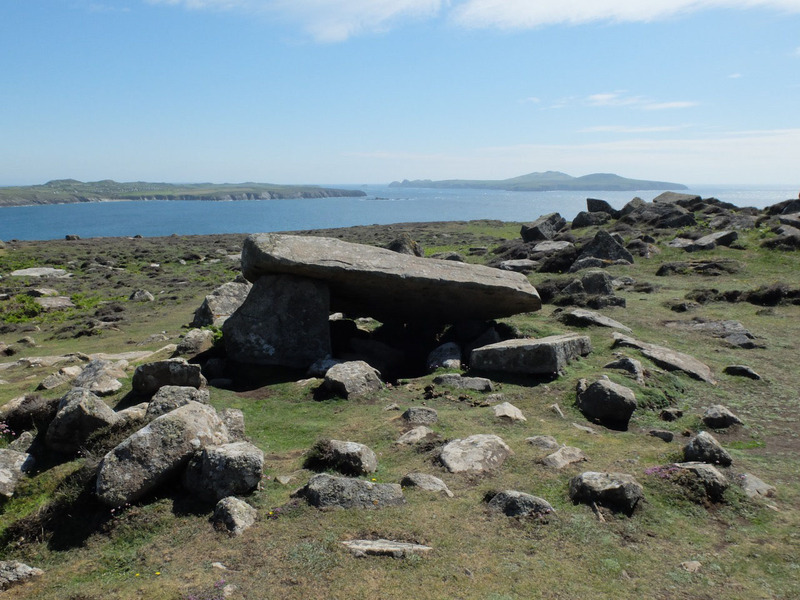 Our historic research duo have carried out extensive work on such ancient sites and gained their own insights by being sensitive to the land’s own story. This journey to a deeper perception of natural surroundings is well-documented in their books. 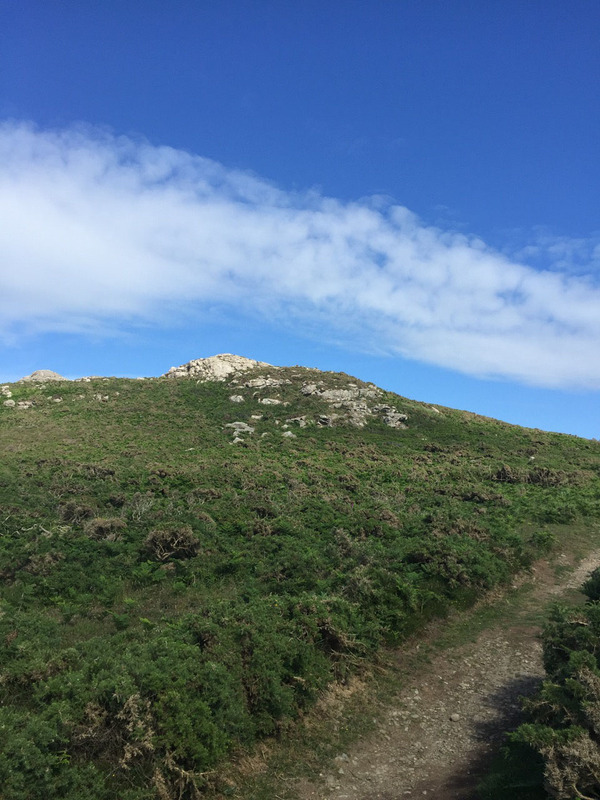 After a suitable time for personal exploration and meditation, we picked our way, carefully, back over the rocks to take a slightly different path in the direction of a distant hill – Carn Llidi (which turned out to be closer than it looked). 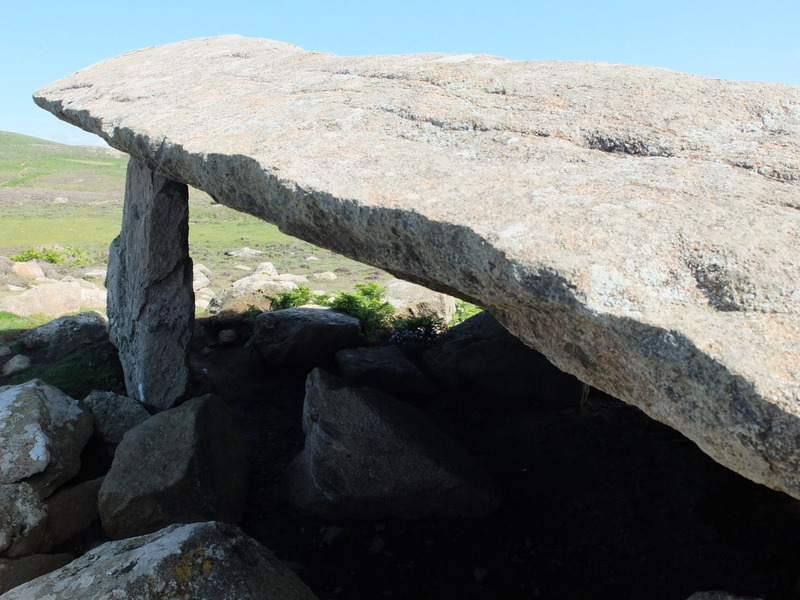 After a short way, we stopped in surprise at the sudden emergence of Coetan Arthur, a Neolithic burial chamber (A dolmen in this case) dating from about 4000BC. It has a huge capstone almost 20ft wide, which is supported by a side stone over 3ft tall. It was almost certainly built this way, with one end resting on the ground, as what is known as an ‘earthfast’ megalith. This use of ‘Arthur’ is not related to the Arthurian tales, but linked to an ancient use of the word ‘Bear’. Approaching these ancient sites, it is difficult not to feel an immense sense of respect and reverence for what the builders crafted. We know very little of their full purpose, though burial of the ‘long bones’ of key individuals seems to have been a common element. 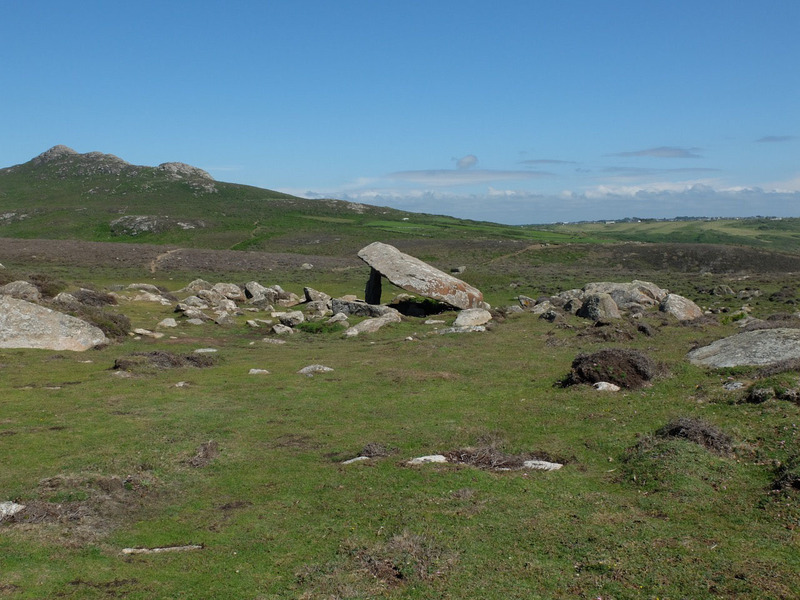 Although they may look crude by today’s standards, the sheer ‘presence’ of these stone megaliths may be a result of the fact that they used rocks of certain size, shape and proportions that were ‘found’ naturally in the earth, thus giving a specialness to their placing. 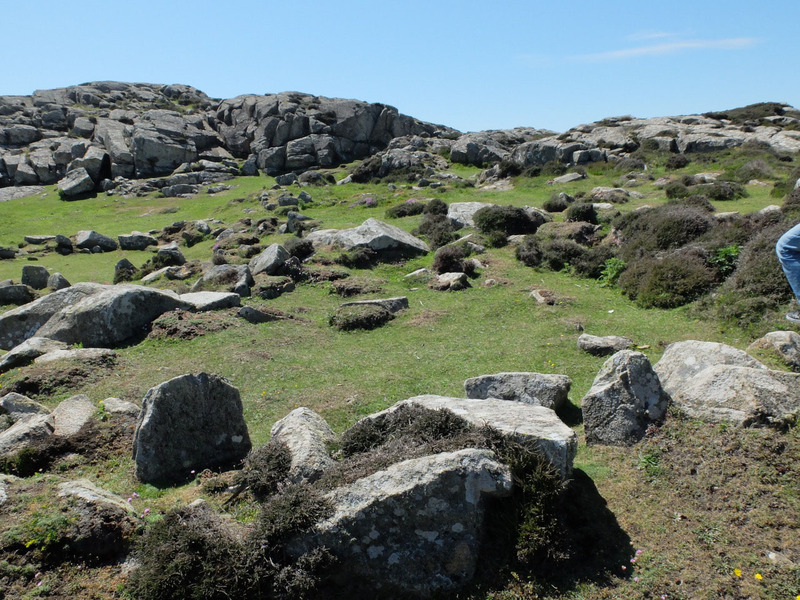 As Sue and Stuart explain, such stones were the very ‘bones’ of the ancient earth and revered as part of a living body that sustained all life. We would struggle to recreate them, today. One of the smallest, the capstone of Coetan Arthur weighs 4.6 tons. 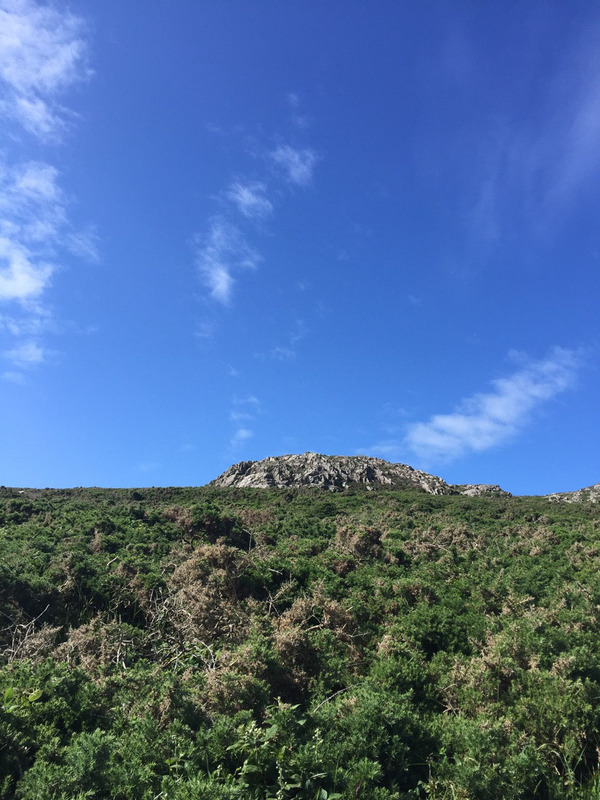 It is believed that it was created to mirror the nearby peak of Carn Llidi, which was to be our next compass bearing for the final leg of the afternoon’s walk. For my part, I am always taken by the importance of these structures as ‘keepers of time and place in the cosmos’. The were usually oriented east-west, though there are exceptions. 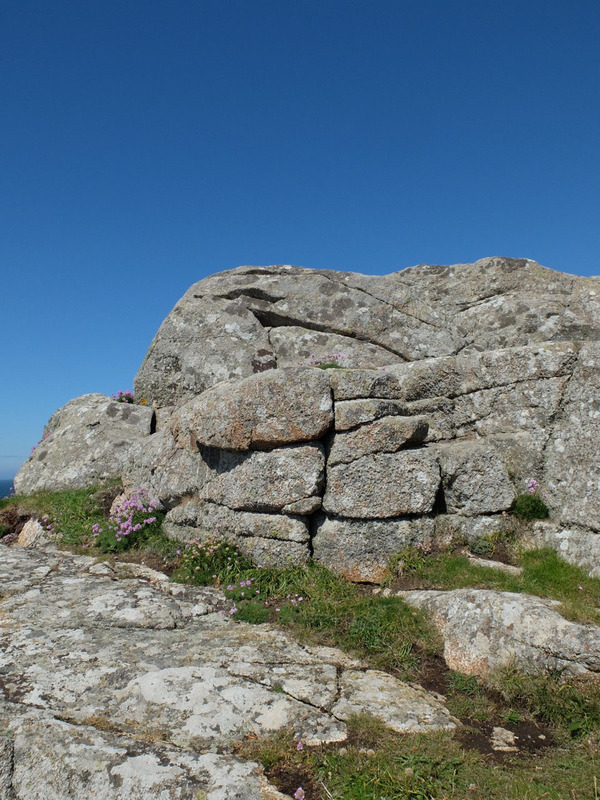 They were placed in relation to other stones in the landscape which gave the positions of the sun at the four key points of summer and winter solstice (maximum and minimum days), and spring and autumn equinox (equal night and day). The passing of the year would have been of great significance to our ancient forebears. The cycles of planting, fallow, growth and harvest were key to their survival and they had to know where they were in the year. There was, undoubtedly, a deeper aspect to it all; in that they felt an intensity of relationship with the sky above them, as well as the air they breathed, the water they drank, and the ground below, in which all foods, apart from meats, grew directly; and meat was dependent upon vegetation in the greater cycle. Their connection to the natural world, and its cycles, was therefore part of their deepest experience – so much so that people like the Druids were a specially trained layer of their society whose role was to honour and deepen the understanding of this relationship of mankind (observer; man and woman) to that which was observed and whose deepest secrets (untouchable but capable of being seen) were painted in the geometry of the night sky. 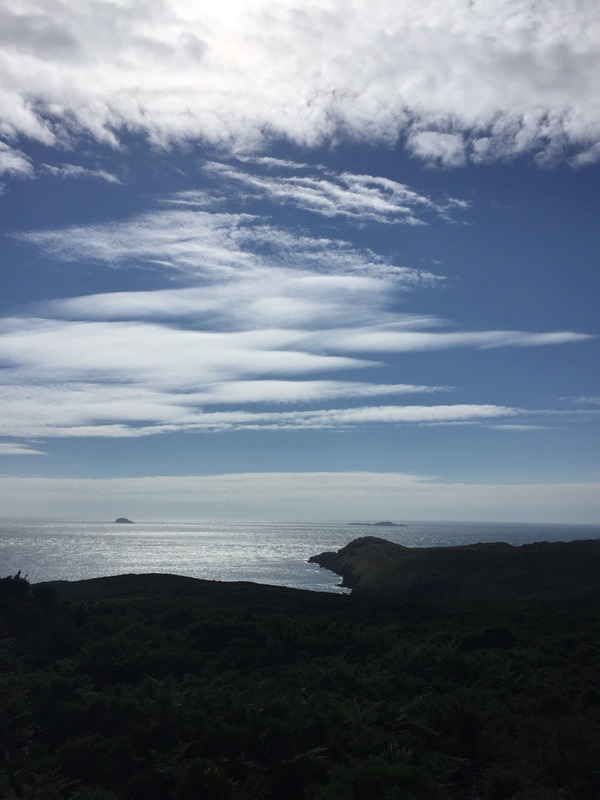 The final leg of the walk (though not of the day) was to take the path over the hilltop of Carn Llidi and back to join the road to the lovely Whitesands beach. One of our number sprinted off to gain the actual peak, but the rest of us were content to amble along the high road and take in the scenery. 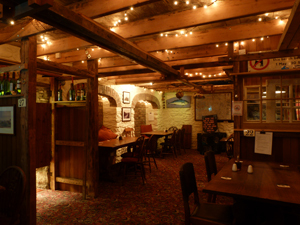 Then it was time to return to the hotel to change, and a gentle walk into St David’s to have a pub dinner at The Bishop. All in all, the perfect Day One of our Whispers in the West weekend. The Silent Eye runs four such weekends per year; in April, June, September, and the start of December. Apart from the main April workshop, which combines mystical drama with teachings, they are very informal occasions, but a good way to meet some of the names and faces from the Silent Eye School of Consciousness. Everyone is welcome – we simply wander in a landscape and get to know each other. 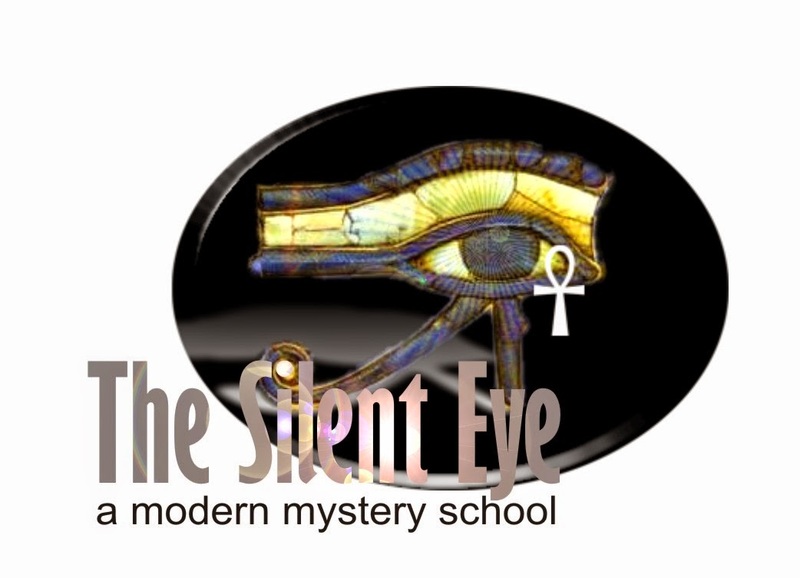 The formal teaching programme of the Silent Eye School is a three-year correspondence course, studied at home and in the individual’s daily world, with personal supervision via email, and workshops. 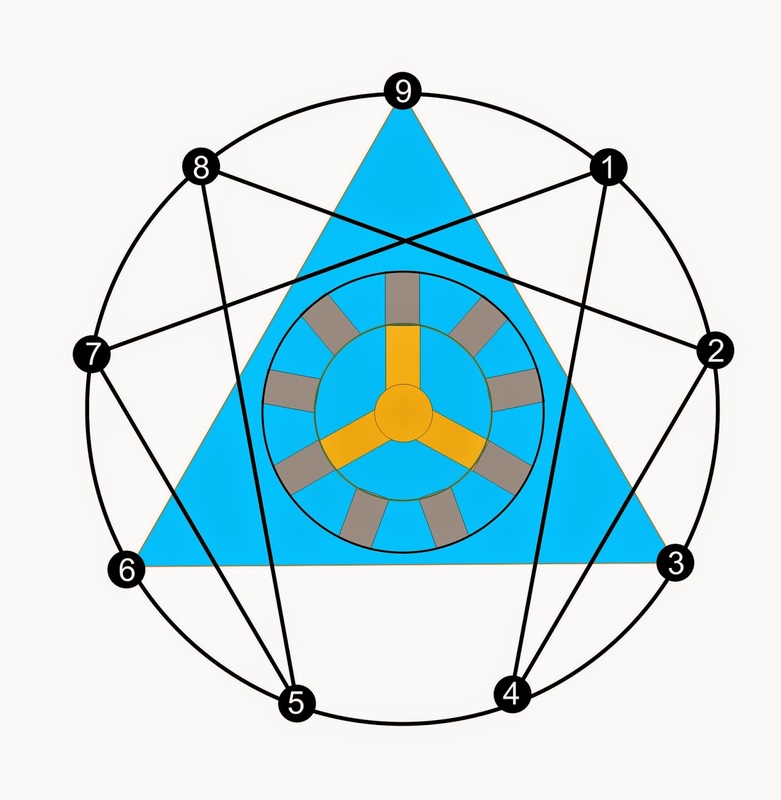 The teaching programme is based on a guided journey through the spiritual layers of a nine-pointed figure called the Enneagram (below). The Silent Eye is a not-for-profit organisation and charges as little as possible for its work. The Silent Eye’s version of the enneagram. 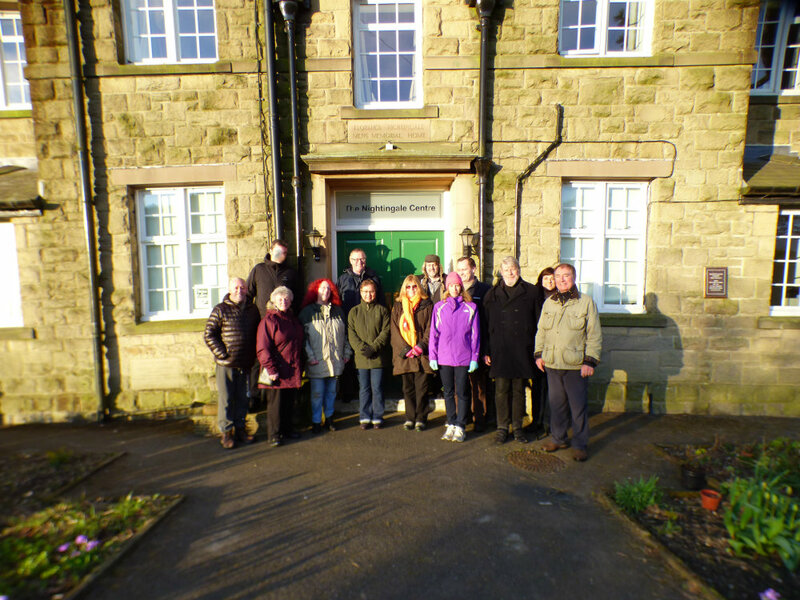 You can find details of the forthcoming events for the year on our website. Wonderful – excited to be with you exploring a completely new-to-me place. Glad you liked it, Mary. Lizzy did us proud with the weekend.